Vaclav Havel was born in Prague into a prominent and wealthy family that saw its estate nationalized when the Communists came to power. Because of his bourgeois background, Vaclav was barred from attending secondary high school. He trained as a carpenter and then as a lab technician while at the same time attending secondary school evening classes. Since his background also barred him from studying in an arts faculty, at university he studied economics. After his military service he worked as a stagehand at the “Na Zabradli” [On the Balustrade] theatre, where he staged his first plays, encouraged by the director. In 1964 he married Olga Splichalova and the following year joined the editorial staff of the monthly magazine of the Czechoslovak Writers Association. After Havel had spoken out on several occasions against the persecution of writers, his name was removed from the list of candidates for positions of responsibility within the Association. In the Seventies Havel’s works were banned and withdrawn from all libraries and he was constantly persecuted by the regime. In December 1972 Havel and 35 other Czech writers addressed a petition to president Husak demanding an amnesty for political detainees. On 8 April 1975, he sent his famous Letter to the general secretary of the Communist Party Gustav Husak, in which he depicts Czechoslovakia as a society governed by fear. At the end of 1975 he founded the underground magazine “Expedice” which published the works of Czech and foreign authors. In August 1976, with other writers and philosophers he addressed a letter to Nobel prizewinner Heinrich Böll asking for solidarity for the imprisoned “Plastic People” rock group. Their trial and the ratification of the Final Document of the Helsinki talks led to new cooperation between the dissidents of the “Prague Spring” and Christian circles. These relations resulted in Charter ’77: “a free informal and open community of people of various persuasions, religions and professions, linked by the will to work individually and jointly for compliance with civil and human rights". On 1 January 1977 the Charter ’77 declaration was published. The first spokesmen of the Charter were Vaclav Havel, Jiri Hajek and Jan Patočka, who died on 13 March 1977 after being subjected to extenuating interrogation. The next day, Havel was arrested and charged with crimes against the State. Released in May, he was then subjected to a defamatory campaign that forced him to abandon his post as spokesman of the Charter. In October 1977 he received a 14-month prison sentence and 3 years’ probation for having damaged the interests of the State abroad. On 27 April 1978 he and others set up the Committee for the Defence of the Unjustly Persecuted (VONS); in October he wrote his most famous essay: The power of the powerless and the theatre piece The Signature, and from 6 November he was once again the spokesman for Charter '77. On 29 April he was arrested along with 15 members of the VONS, charged with subversion and sentenced to 4 and a half years’ imprisonment. From the jail he wrote 144 letters to his wife, collected in Letters to Olga. He was released from prison in January 1983 due to ill health. In the following years Havel never gave up fighting for the persecuted, neither did he abandon his vocation for the theatre. On 11 November 1986 he received the Erasmus Prize "for his contribution to European culture". On16 January 1989, the anniversary of Jan Palach’s suicide, Havel was arrested yet again and sentenced to nine months in jail for placing flowers at the foot of the St. Wenceslas statue. On 19 November 1989 he and others founded the Civic Forum, which was to provide the main framework for the “Velvet Revolution”. On 29 December he was elected President of the Czechoslovak Federation, an office from which he resigned on 20 July 1992, after the split from Slovakia. On 26 January 1993, the Czech Parliament elected him the first President of the Czech Republic. In January 1996, his beloved wife Olga died after a long illness. 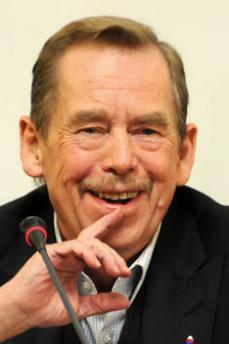 On 20 January 1998, Parliament again elected Vaclav Havel President of the Republic and he remained in office until 2003. Since 6 March 2013, first European Day of the Righteous, a tree and a stone have been dedicated to Vaclav Havel at the Garden of the Righteous Worldwide in Milan.